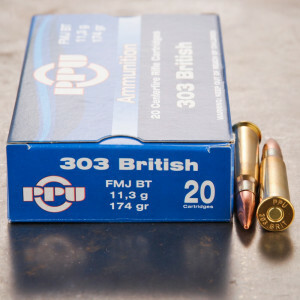 Full metal jacket .303 British ammunition is a cartridge whose bullet has a hard outer jacket that does not expose the bullet's lead core. This hard outer jacket enables the bullet to deform very little when hitting its target. This style of FMJ bullet leads to much less damage to the target than other projectile designs. 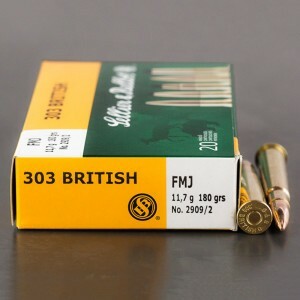 Since the .303 was originally a military cartridge, it most common bullet design was the full metal jacket. This fact was due to the rules of military engagement requiring a bullet which caused "less damage" when used on humans in military conflicts. At one time, the military actually used a non-full metal jacket round but dropped is use because of the significantly higher damaged caused by that bullet in combat. One can still obtain factory ammunition with full metal jackets in various bullet weights, even the original 215 grain offering. 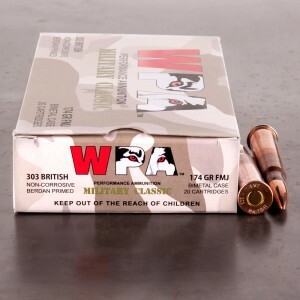 Fast shipping ammo as promised cant wait to try at range. Never disappointed with wolf ammo. Been using Wolf ammo for a few years now and when others told me not to buy it, I keep going back for more. The price and quality are great. I have not had any problems with the brass/steel casings. I have not found any problems with the function of my rifle. I have put some 5,000 rounds through my Ar with no problems and its powders burn clean. Picked up an old Lee-Enfield and wanted to try an assortment of different loads at 100 yards. These rounds did a great job of finding their targets and burning clean in the barrel. Picked up an old Lee-Enfield and wanted to try an assortment of different loads at 100 yards. These rounds did a great job of finding their targets and burning clean in the barrel. 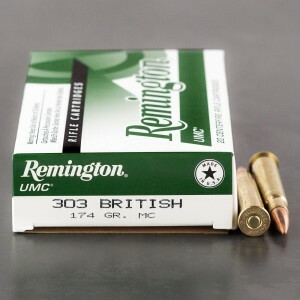 These rounds have a bit more punch then the other rounds I have fired, but that is what I expect from Remington.